Well this Queenie is very proud! 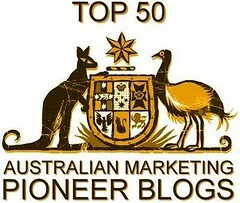 Publicity Queen has been included in the inaugural Top 50 Australian Marketing Pioneer Blogs which has been compiled by Julian Cole of Adspace Pioneers. The list is also to be published in the August edition of Marketing. The Editor of Herald Sun’s BusinessOwner section, Claire Heaney, has asked me to tell you about a survey (with lots of great prizes) that the paper is running.